These days there are all sorts of workouts available to us like pole dancing, zumba, cross fit training, aerobics, striptease. We are so lucky to have these various workouts to choose from and find the one thing that will work for us. Aside from having these interesting and innovative workouts, we also have all sorts of specialized equipment and machines to help us get the workout that we want and every few months these machines get fancier and even more high-tech. Now we have treadmills that can help us determine the right program and workout for our body weight and habits. We have complex weight lifting machines that can test our strength and endurance. Did you ever wonder what kind of workouts the old school calisthenics masters used back in the day? What did the old masters do and use to get those massive muscles and well-toned physique? 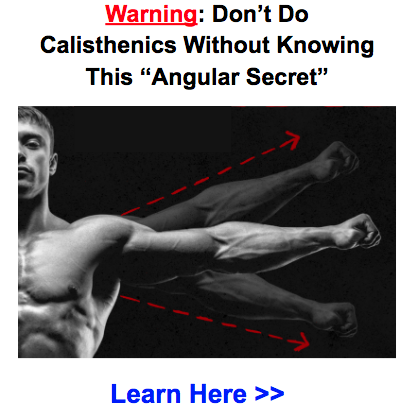 Well, you’re in luck because we’re featuring seven old school calisthenics masters and their workout secrets! Joseph Goldstein, also known as The Mighty Atom, stood a mere 5 feet and 4 inches and 140 pounds, but he was one of the leading strongmen of the 20th century. He worked as a field oil and dock worker and wrestled professionally as Kid Greenstein. In 1914, he was shot between the eyebrows, but, amazingly, the bullet did not enter his skull and was apparently flattened by the impact. It was said that the experience sparked his interest in mental powers and strength. 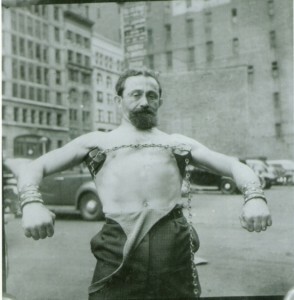 Some of The Mighty Atom’s feats included using only his bare hands to drive 20 penny nails through a 2 1/2 inch thick board, changing a tire on a car without the use of any tools at all, breaking chains by chest expansion, biting nails in half using his teeth, bending steel bars with his hair, and resisting the pull of an airplane with just his hair. The man was downright unbreakable, even down to his hair. In terms of workout or training, Joseph Goldstein was not a traditional weightlifter. He used his entire body in heavy efforts. He was a great believer in isometrics and high repetition training. He was also very much into mind power, deep breathing, and sticking to a very clean diet. Bert Assirati was an English pro wrestler and multiple-time British Heavyweight Champion. After his death he was made a member of the Wrestling Observer Newsletter Hall of Fame. He was best known for setting a British world record in 1983 by pulling at arms length a two-hundred pound barbell while lying on his back. 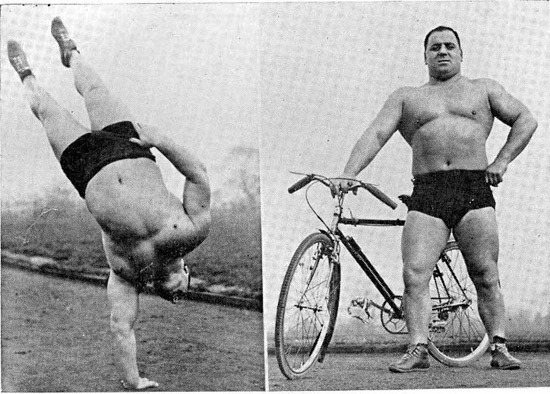 He was also known as one of the heaviest men to do an iron cross and was famous for being able to do one-arm chin ups even he weighed 240 lbs. 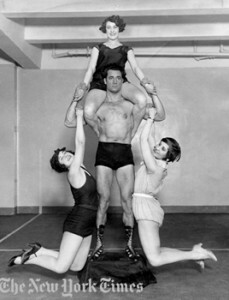 He was also famous for his speed and agility, a result of his gymnastics and acrobatics background. At twelve, Assirati began weight training with his mother’s flat iron. His father then took him to the local gym where he trained in wrestling, hand balancing and gymnastics. Assirati also trained in weight lifting and acrobatics. In his later years he became fond of cycling. His early training, determination, and winning attitude definitely paved the way for his success as a respected wrestler and strongman. 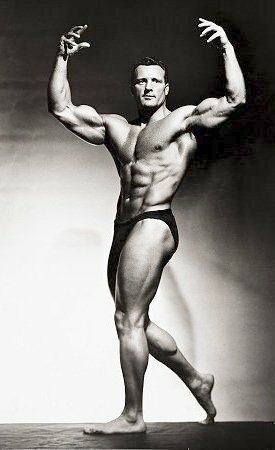 Charles Atlas was born Angelo Siciliano and he was known as the founder of a bodybuilding method called Dynamic Tension. Atlas’s method became very popular because of the iconic ads that appeared in comic books. The ads featured a “weakling” who got beat up by bullies, but became stronger and bigger through Atlas’s workout program. The “weakling” ended up getting his revenge on the bullies. The story was said to be loosely based on Atlas’s experience but several versions had been used through the years. Atlas’s method was being marketed as the method that could turn a “97-pound weakling” into a muscleman. Atlas’s Dynamic Tension method is a set of self-resistance exercises that pit muscle against muscle. There is no use for weights or gym equipment. The method is a combination of body weight exercises and dynamic tension exercises. Atlas also incorporated isometrics in this workout. To this day, the Charles Atlas method is still available to the public. 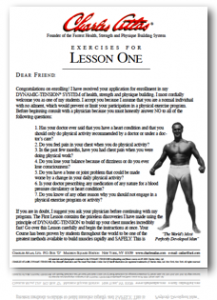 To download his full book, “The Charles Atlas Body Building System” for FREE click the link. John Carroll Grimek is well-known as one of the greatest weightlifters and bodybuilders in the 1930’s and 1940’s. He won several bodybuilding titles including York Perfect Man (1939), Mr. America (1940, 1941), Most Muscular Man in America (1946), Mr. Universe Short & Overall (1948), and Mr. USA (1949). 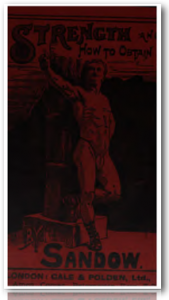 Aside from his bodybuilding events, Grimek also competed in weightlifting at the 1936 Olympics in Berlin. He was undefeated in bodybuilding when he retired. Even when he was in his late 60’s, he could still squat with over 400 pounds. That was how dedicated he was to his workout regimen. Grimek followed a specific chest expansion program involving squats and increasing weights with each succeeding squat sets. He believed in building a great chest from the inside out and not just focusing on the external muscles. He regularly performed exercises that stimulated deep breathing in order to enlarge his rib box. Grimek was also a big believer in creating variety when working out. For him, variety stimulated muscle growth and kept a lifter’s training program interesting. For example, with bench exercises, he liked to mix it up by doing exercises on different planes–supine, incline, and decline. Grimek also believed in training the body as a whole and he often performed whole body training three times a week. Aside from bodybuilding, Grimek was also into hand balancing and acrobatics and was known to be very good at doing handstands, splits, and backbends. 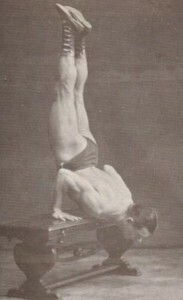 Grimek’s combination of bodybuilding, hand balancing, and acrobatics definitely made him one of the most unique bodyweight athletes known to man. Eugen Sandow, a Prussian, was born Friedrich Wilhelm Müller. He left Prussia to avoid the military and toured Europe as a circus athlete under the name Eugen Sandow. He was a pioneer in bodybuilding and was known as the “father of modern bodybuilding.” In 1897, he built the Institute of Physical Culture, an early gymnasium for bodybuilding enthusiasts. In 1898, he founded a monthly periodical called Physical Culture, which was renamed to Sandow’s Magazine of Physical Culture. In 1901, Sandow held the first major contest for bodybuilding at the Royal Albert Hall. Sandow’s physique resembled that of the physiques of Greek and Roman sculpture. He helped develop the Grecian Ideal formula for the “perfect” physique by measuring the sculptures and building his body to the exact proportions. He was called the father of modern bodybuilding since he was one of the firsts to develop his physique according to pre-determined measurements. Sandow was very methodical and scientific in his approach and even came out with books–Sandow’s System of Physical Training and Strength and How To Obtain It–to lay out his training recommendations. His muscle building workout involved extensive use of dumbbells, which he felt should be the core of one’s muscle building exercises. His training recommendations also included exercising where there is fresh air and exercising progressively, avoiding overtraining. He also believed in a mind-body connection during training. Sandow’s scientific and focused approach made him a master of his own body and made him one of the strongest and greatest physiques in bodybuilding history. If you are looking to read more about Sandow’s training methods, click here to download his book “Strength and How To Obtain It” for FREE written in 1897. Siegmund Klein was originally from West Prussia and had a normal childhood. His father was a strong man in his right and could lift a 112-pound ring-weight with the little finger and bring it on a normal table. Perhaps that had some influence on Sig Klein’s bodybuilding dreams. Sig Klein was a natural lover of sports and exercise and at the age of 17 started training regularly with barbells. Within a few months he could lift a hundred pounds with the two-hand press. He eventually doubled that to 200 pounds after training for two years. He began appearing on shows and doing some lifting and hand balancing to the delight of crowds. As a bodybuilder and performer, Klein was well known for handstand presses. He specialized in tiger bends and handstand presses. In 1927, Klein took over the management of the gymnasium of Prof. Attila, World Famous Strength Performer and bodybuilding celebrity trainer. That was the first step to Klein’s dream of owning the best barbell gymnasium in the country. After some years he eventually opened his own gym in New York. His place eventually became known as the Mecca of strong men. Jasper Benincasa was another legend in the world of bodybuilding. He was known as a master of chinning and bodyweight strength training. He was famous for doing one arm chins with a man held between his legs. He once climbed a rope with a 148-pound person wrapped around his legs. He was also famous for doing a Close to Impossible hold which involved keeping arms parallel to the ground while holding himself up by a horizontal bar with his hands. Benincasa developed a training method involving one-arm comedowns. Alternate one-arm chins were the core of his workout. There you have it. A bit of insight into the workout secrets of seven old school calisthenics masters. One thing they all have in common is sheer determination, focus, and total belief in themselves. What do you think of the methods of these old school legends? 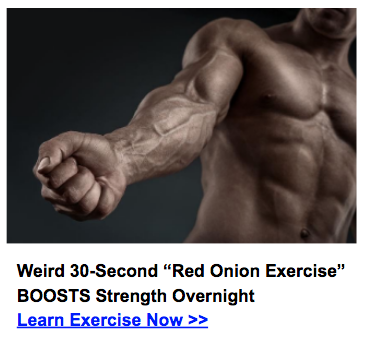 Which workout program specifically are you referring to? According to Wiki, John Grimek passed away in 1998 and not 1988 as you have listed. I can’t say who’s right and who’s wrong, just letting you know.